And it's bringing some exclusive content with it. Good news for Rayman fans who hate sitting in front of the TV to play games. The famously delayed and formerly Wii U-exclusive platformer Rayman Legends is now heading to PlayStation Vita, releasing alongside the console versions later this year. The game packs all of the same content as its non-portable companions, adding in some extras because Ubisoft probably still feels a little guilty about that whole delay business. Let's just be quiet and milk this until launch day, ok? 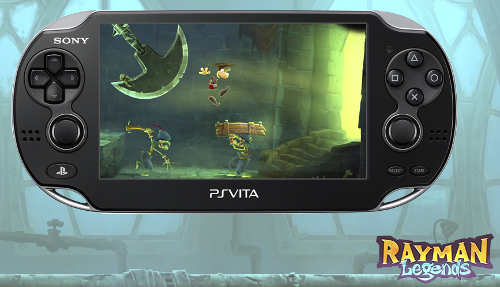 The Vita-exclusive content includes five new maps playable by Murphy, the green fly guy from previous Rayman releases, controlled via the rear touch pad. Online challenge levels have been implemented as well, giving you an excuse to strike up some rivalries with random people on the leaderboards (we're looking at you, applepieater427). And finally, two new costumes ship with the Vita release, giving Rayman a Prince of Persia outfit to wear along with a stealthy Splinter Cell costume for Globox. Earlier this month a handful of bonus pre-order costumes were unveiled for the console versions of the game, meaning the artists at Ubisoft Montpellier are probably wondering if they could add "tailor" to their resumes.